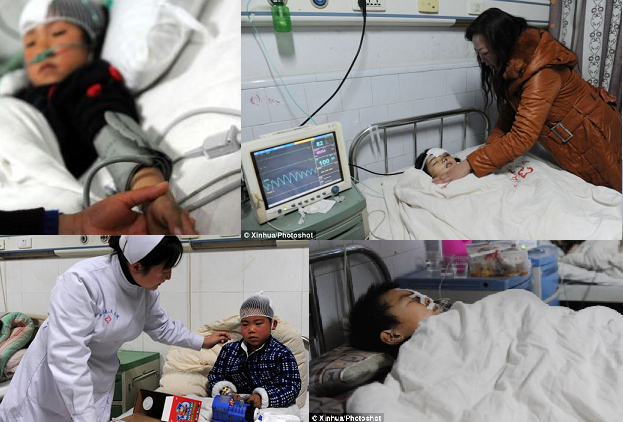 Similar to the Connecticut attack on kids , Min Yingjun, 36, stabbed an elderly woman before bursting into Chenpeng Village Primary School and stabbed 22 primary school children with a knife in the Henan province. According to local reports,none of the children died but nine of the students aged between 6 and 12 years old were taken to hospital. Some of the children had fingers and ears cut off and 2 were flown to a better equipped hospital outside of the country. Min Yingjun from Guangshan county allegedly stabbed an elderly woman at her home and then moved on to children as they arrived for school in the morning before being subdued by security guards. It is being reported that the local police's initial assessment of Min states that he is possibly mentally ill. There were several similar knife attacks in China that targeted school children in 2010. To curb this, the government increased security at schools and require people to register their national ID cards when purchasing large knives. I am speechless, this is crazy!